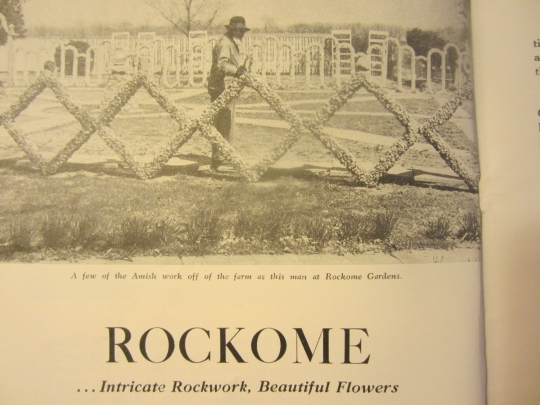 On my latest visit to Indiana, a friend gave me an interesting document–an old booklet for Rockome Gardens, a long-running tourist destination featuring rock gardens, intricate stonework and other attractions, located in the Arthur, Illinois Amish settlement. 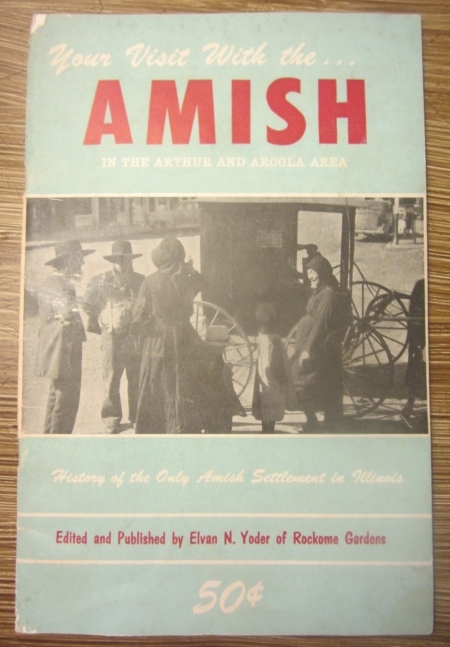 The booklet is entitled “Your Visit With the Amish in the Arthur and Arcola Area”. I’m not really a collector, but old-time tourist memorabilia tends to catch my eye, and this publication did not disappoint. 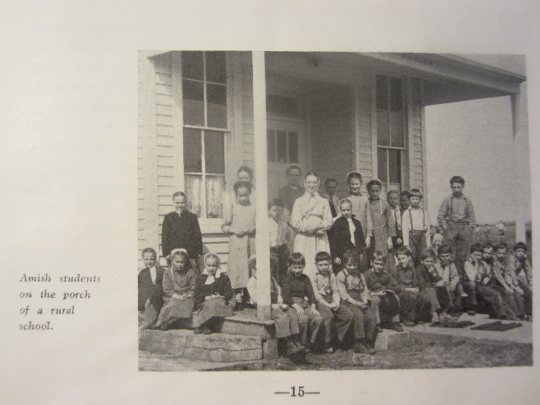 The first 15 pages cover the history and culture of the Amish, along with a number of fascinating black-and-white photos of the Arthur community. The final 8 pages are on the Rockome attraction. Though there is no date of publication in the booklet, one source I located put it at 1958, which was around the time Elvan Yoder acquired the property. Other clues suggest that it may have been printed around that time or soon thereafter. In one section Yoder writes that “[we] plan to operate it along the same lines as did the Martins [the original owners]”, suggesting that their acquisition of the property was recent at the time of publication. The Martins started off with a dream to have the largest flower garden in Douglas County. They purchased this 208 acre farm, five miles west of Arcola, and decided to devote 7 acres of the farm to flower gardens, rock formations and their summer cottage. Work toward development of the gardens has been going on since 1937. 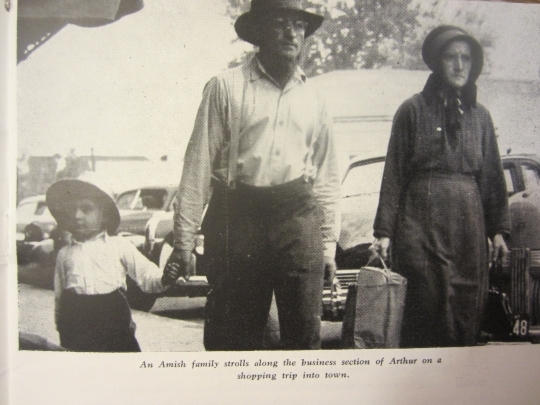 Arthur Martin was the owner of Progress Industries in Arthur, IL., and work was slow due to the war and the depression. Instead of letting his workers become unemployed, Martin sent them out to construct rock formations and fences on his property. The first gardens to be constructed were the sunken gardens. More gardens were added, the project expanded and grew to a large scale, to the point that visitors came from all over to view the property. The Martins eventually donated the property, in 1952 to the Mennonite Board of Missions and Charities of Elkhart, Indiana, who turned it into a retirement facility for missionaries. The group later sold the property to Elvan and Irene Yoder, who transformed it into a tourist attraction. The name is a melding of “Rock Home”. Rockome has since passed through a series of owners, last changing hands in 2011. According to the website, the current owners, previously frequent visitors to the site, “noticed that Rockome was in need of major repairs and renovations” and “are intent upon bringing warmth and beauty back to Rockome”. 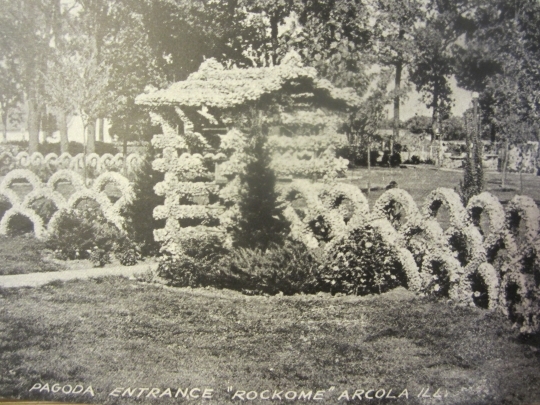 In 2010, the Illinois Amish Interpretive Center moved to Rockome. You can read more on the Rockome website. 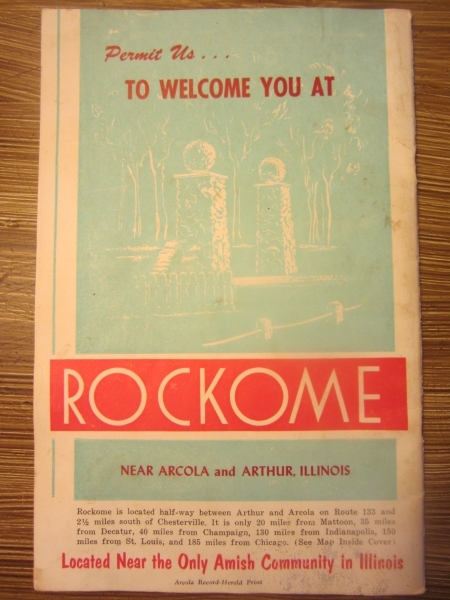 Rockome is an attraction in and of itself, but no doubt benefits from its close proximity to the large Arthur Amish community, which the creator of this booklet certainly recognized. 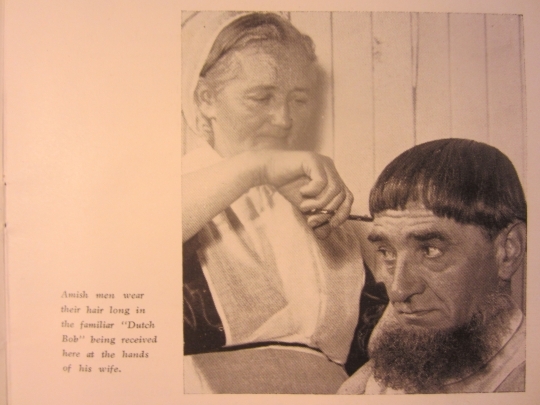 This publication gives us an interesting look at how the Amish were presented to a tourist audience decades ago. Elvan Yoder was raised Amish and no doubt drew on his personal knowledge to create the booklet. Intended as it was for a tourist readership, some information seems a little off, particularly in the discussion of Amish history, which gets some names wrong. I tried to imagine what it would have been like learning about the Amish people, possibly for the first time, from this publication fifty years ago. It would have been a time of relatively little available info on the Amish, certainly not like today, with books, television, blogs and so on. While it’s no Amish Society or Riddle of Amish Culture, you would probably come away from reading this with a decent idea of who the Amish are. It touches on a broad range of topics, including Amish church, education, food, and mutual aid, and seems fairly well done given the time and its intended audience. Here are a few of the photos found inside. I don’t have specific dates for any of these photos. This first shot is actually of the back cover. “Located near the only Amish community in Illinois.” The Arthur community was founded in the 1860s. The second-oldest Illinois settlement has only been around 20-some years. A number of churches which started out Amish in Illinois are not part of the Old Order circle today. 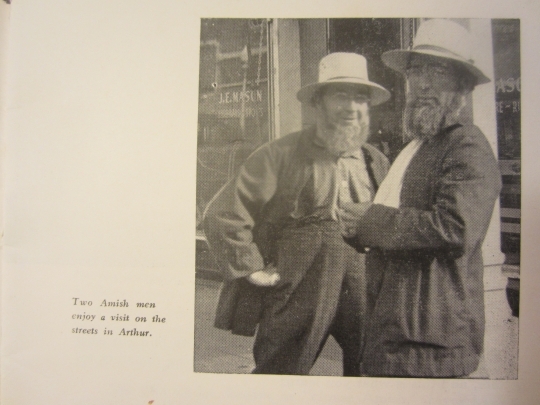 “Two Amish men enjoy a visit on the streets in Arthur.” Hey now, no posing. “An Amish family strolls along the business section of Arthur on a shopping trip into town.” Mom looks most ready to be home already. Little man looks amused by something. “A scene along State Route 133 where the state maintains a road for “Old Dobbin” as well as for the modern automobile.” Route 133 is the main artery dividing this settlement. It takes you right through Arthur and on to Arcola. 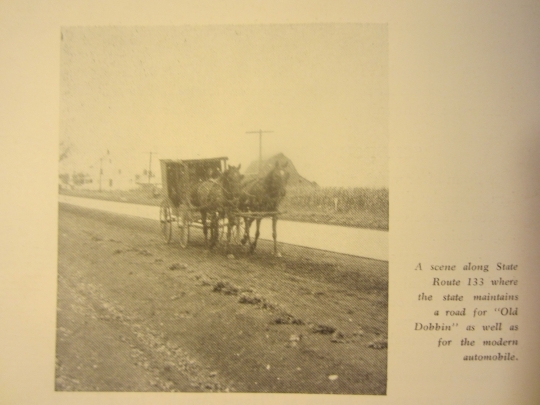 It appears this “Dobbin lane” was dirt or some natural surface at the time. 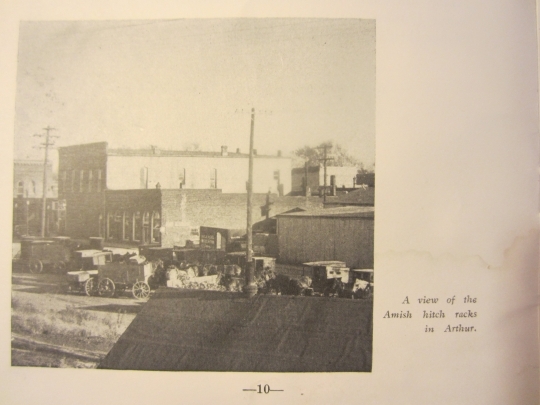 “A view of the Amish hitch racks in Arthur.” This photo just feels especially old to me. Maybe it’s because no cars can be seen. 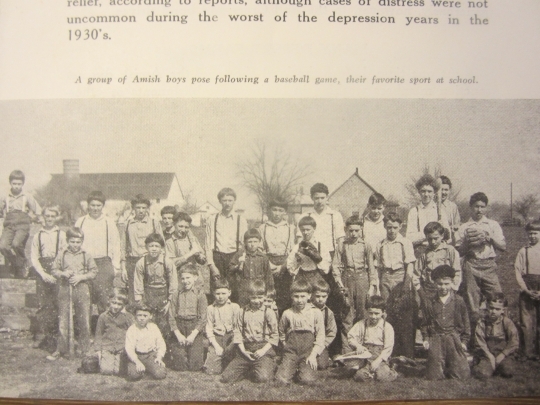 “A group of Amish boys pose following a baseball game, their favorite sport at school.” Looks like a lot of other team photos I’ve seen. There is another photo in the booklet of the girls watching the game. Not all of the original rock creations survive. The property’s rock homes were torn down a few years ago due to deterioration. Rockome has also added a number of other attractions, such as a cheese factory, buggy rides, and a horse-powered buzz saw. I hope you enjoyed that look back in time at Arthur and Rockome. Switching gears, quite a few serious, even deadly accidents involving Amish have been happening recently, including in Flat Rock, Illinois; Pontotoc, Mississippi; Daviess County, Indiana; and Pawnee City, Nebraska. One reporter wrote a piece on the Pawnee City community, which experienced the loss of a young man in a buggy accident last Sunday. The article is a nice look at a growing settlement, albeit one inspired by sad circumstances. A number of these accidents have occurred in small communities just a church district or two in size. The Amish population has been historically sparse in Nebraska, but this was apparently the first buggy accident in the state this century. Ohio, by contrast, averages over 120 buggy accidents each year. Finally, you might recall me mentioning Gordonville Bookstore on a number of occasions. It is one of the best-known Amish bookstores, in part for its location in the heart of Lancaster County. This is usually one of the last few stops I make on my way home from PA. If you’ve never been inside the store, a reader who recently visited shares a photo which I thought you might enjoy seeing. 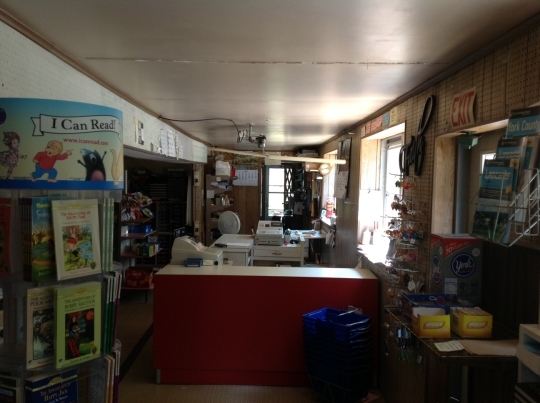 This is the inside of Gordonville Bookstore, facing the check-out counter and register. I pick up publications like The Diary or the occasional Ladies Journal (research purposes, folks) from a rack on the right-hand side, just out of view in this shot. Elvan Yoder was my uncle. I can remember visiting and playing here as a child. Marcus I remember now you commenting on your uncle. I should have asked you for some input on this. You don’t happen to know a more precise date for this booklet or photos? It’s a very interesting little booklet, by the sounds of it. I love collecting booklets from different attractions, events or communities telling the story of their community or the history of an event that might have happened there. The boys baseball picture could probably pass for any rural American group in the 1950s, or certainly before, again with my relatives, my rural male relatives between 1935 and 1955 seemed, by the pictures we have of them, preferred short sleeve work shirts, but the style of clothing, particularly the pants (minus the straw hats, my Manitoba relatives are never pictured with straw hats on, neither fedoras or even Stetsons for some reason) certainly matches, although I suppose though looking the same, English farmers of the day might have preferred zippers, some might have continued to wear buttons, though it probably depended on cost, it was increasingly rare. I am getting sillier now, I love the hairstyle of the man getting his hair trimmed by either his wife or some other female relative or friend, the hair style is certainly a reminder of the nineteenth century, a reminder of Moe from the Three Stooges (minus the beard) and a hint, at least in my imagination toward a certain Liverpool, England rock band that would emerge to worldly prominence in the English world not terribly later in the 1960s. Seriously though, for a very long time, that kind of hairstyle was very common. [The silliest bit] Speaking of that English (British) rock band, in what I’d call the Amish family portrait, doesn’t the father look a lot like a clean shaven John of the late 1960s and 1970s vintage, I mean look at his face, the nose, the mouth, the glasses, if we where a dumb conspiracy theory group I’d suggest that Lennon had stumbled across time travel and abandoned the stress of the rock star life in 1980, went back to the 1950s and started life again as an Amish farmer in Indiana. Again, let me thank you, Erik for sharing excerpts from this booklet, it is fascinating. SHOM, you, sir, are as hilarious as you are observant. Thanks for sharing your thoughts with us. Just looking back at the haircut photo now Shom, I like the look of semi-concern on his face. Assuming that’s what it is, is he more worried about getting an ear nicked or too much hair landing on the floor? Thanks for sharing this this. It was very interesting. Loved all the pictures. We have been a visitor of Arthur, yearly, for 15 yrs. We have tried to dine at Rockome Garden twice and found it to be awaste of our money and time. Hopefully there are new owners and/or waitresses because we could have spent our money better elsewhere. However, Arthur is still our favorite of all the Amish settlements. We traveled to Ethridge Tn last and spent a couple of days. That is a totally different experience then what we have in Arthur. My sister and I have been taking our children to Arthur and Rockome Gardens for about 25 years. We have seen the Gardens in their former good times and then the bad times and now on the rebuild. The new owner seems to be trying to bring it back and has built at least one new building. The Harvest Festival that they used to have at the Garden was a great time — my niece rode on one of the wagons and pitch hay. I love the whole area and hope to get back there soon but at least in time for the Great Pumpkin Patch in October (and the bakery)and to wander through the country side and visiting the various cottage industry shops in the area. 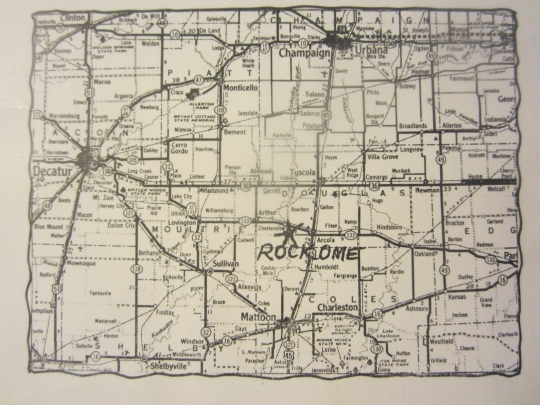 My only experience of Rockome has been passing by on the road, as it sounds like early visitors experienced it. I was selling books over 14 hour days at the time and didn’t really think about it other than as a landmark. Thank you Eric. I love looking at old pictures. What struck me was the posed for pictures of the Amish. Apparently this old order group was more lenient than others when it came to pictures. My favorite, the two men caught on the street. A contrast in personality. Love the smiling gentleman. I would have loved to know him. I loved the pictures. It’s always good to see the pictures from the past. Gives one a good idea on how things may have been at that time. Thanks for showing us yet another glimpse into the Amish world. … about what it would have been like 50 years ago relative to trying to learn about the Amish; as Erik noted in this comment from his post: “I tried to imagine what it would have been like learning about the Amish people, possibly for the first time, from this publication fifty years ago. It would have been a time of relatively little available info on the Amish, certainly not like today, with books, television, blogs and so on”. I can tell you quite well what my experience was like 49 years ago trying to do so. It wasn’t good. Wasn’t easy, either. I first became aware that Amish people even existed 49 years ago last month when my oldest sister, who was on a senior class trip to New York City & the 1964 World’s Fair, mailed to me a post card depicting a road scene of an Amish horse and buggy in Lancaster County, PA. When she got home a week or so later she told of seeing these people out in their fields using horse drawn equipment and of seeing them on the streets in some of the towns they went through in that part of Pennsylvania. As a then 10 year old (I’ll give you a second to do the math! )I was intrigued and wanted to know more about them. Our little local library had nary a book about the Amish. So I had my mother take me in to the nearby city (Houston, TX), to the Carnegie Branch Library. Whereupon I checked out ALL of the books that they had about the Amish … all three of them. Even as a 10 year old kid I think that I kind of had the impression that two of those books took the information from the other one and just repackaged it. I couldn’t say that I learned a whole lot from those books. If I did, it probably wasn’t accurate and it certainly didn’t stick. In dealing with the Amish from time to time in one of my previous jobs, starting about 1983 or so, and from doing business with them in person, through the mail and over the phone since then I learned a lot more about them, but still I really had learned very little new, in-depth information about them until just the past few years. On this website I have picked up a lot of answers to questions that I had about the Amish, but had no resource to turn to for those answers. I’ve also learned a whole lot about them from reading some 12 to 14 additional books about them in just the past few years. These are almost all books that I learned about through this very forum and which have greatly enhanced my knowledge and understanding of them over what I had previously known. Really, short of living right amongst them, reading this forum and reading the books by the various researchers of Amish and other Plain people have been the best thing I could have done to enhance my understanding of them. When you consider that I was probably more motivated to have a better understanding of them than most people are when they first learn about them and it still took me the better part of a half a century to get past the basic stuff you can kind of see what it was like filtering through the little information about them that was available in the very era Erik is discussing. This anecdote brought home to me what we sometimes take for granted, which is not only available info on the Amish but info on any range of subjects in general. That you had to trek to Houston and then hoard all of the books on the Amish available (all 3 of them) is an amusing image but also makes me glad for what is available today. The issue now is less about gathering the info and more about filtering and processing it. I’ve noticed that these older depictions of the Amish often include the Amish posing for photographs. My understanding is that almost none would do so today and that even trying to take photos of the Amish up close would cause offense and likely end the interaction. Current publications with photos of the Amish usually show unbaptized children, adults from a far distance, or the backsides of people. Did the Amish prohibition on posing for photos emerge gradually, perhaps coming about as instant cameras proliferated? Or did the rise of tourists lead the Amish to articulate this rule, as the Amish tired from constantly being in the camera lens? Or perhaps these old photos actually featured Beachy Amish or Mennonites or a sect which did not have such a rule? Fascinating account, in any case. It is interesting to note at what time that Amish practices were considered “different” from mainstream Americans. Going back 100 years or more, the Amish may have had a different theology, but farming practices and technology would have been more or less the same as their neighbors. There are a number of recorded instances of Amish making formal declarations against personal photos, dating to the mid-1800s. Though I’d agree, there seem to be a good number of older photos with what appears to be Amish as willing participants. Looking through the booklet, it seems that most if not all people featured are Old Order Amish. about Pawnee City, Nebraska. It was interesting and well-written. What caught my attention in that article Al was that the community has grown to 37 families. It looks like there will be a Nebraska Amish presence for a while to come. We just recently found out that Rockome is no more, and were both shocked and saddened. We had visited several years ago and have been promoting it widely to friends, family and co-workers as a wonderful place for a family destination. Before I retired several years ago I had photos in a slide show on my PC with many from Rockome. Ray, here is a recent story in which Rockome is mentioned which might be of interest to you. It’s about the work relating to the Illinois Amish Museum (now Illinois Amish Heritage Center) which was once located at Rockome. The new development plan is broken down into four phases and a current fundraising goal of $1.7 million. An outside consultant has been contracted for fundraising with about $900,000 in pledges to date. The two houses to be restored are those of Moses Yoder, which was the first Amish house built in Illinois (1865), and the 1882 Daniel Schrock house. The Schrock house is nearly restored and is to serve as the interim visitor center until a contemporary museum is built. Eventually the Schrock house will serve as an education and conference center, and be used to serve Amish dinners and as a bed and breakfast. Tours of the house were given during the steam threshing event held in July 2017, and Owen Schrock, who once lived in the house, helped with the tours.